Mindfulness is one of those trendy words that, in the minds of many, seems to be connected to something spiritual or mystical or detaching oneself from the world. But mindfulness is none of that. Simply put, mindfulness is being fully conscious and aware of the present moment. That awareness encompasses paying attention to your thoughts and your feelings, without judging them as good or bad, and understanding how they affect your mind, body, and breathing in that very moment. As a parent, if you understand this concept of mindfulness, you can teach it to your child. In fact, teaching a child who is suffering from anxiety how to use mindfulness skills can actually help them reduce their anxiety. How is mindfulness connected to childhood anxiety? Simply put, research has shown that mindfulness can teach children to regulate their emotions and direct their focus. In turn, this helps them to improve their ability to calm down when they become upset, unsettled, and anxious. Help them understand how their feelings manifest through bodily sensations (attention wanders, getting fidgety, etc.). Guide them to develop an awareness of which experiences happen on the inside (those they can control) and which come from the outside (those they can’t control). Assist them to focus only on the present moment, without worrying about the past or the future. As with everything in parenting, it all starts with you. If you want your child to learn mindfulness skills that can help them with reducing anxiety, you have to first practice those skills yourself. So, educate yourself about how you can incorporate mindfulness into your daily life. It may seem intimidating at first, but if you look closely, you may find that you already use some mindful habits in your day-to-day activities. Build on those! Then, when you’re ready to teach these skills to your child, make sure you keep it simple and age-appropriate and be balanced with your expectations. Overcomplicating the matter or pushing your child to learn mindfulness will only hinder the learning experience. 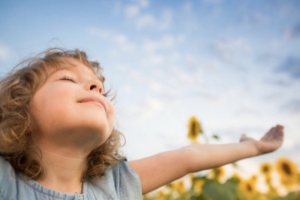 Simply help your child to understand that mindfulness means they learn to notice their feelings, thoughts, bodily sensations, and what is happening around them right in that very moment. And that this will give them the power to make some changes to keep themselves calm. Look for opportunities to provide your child with ways to learn new skills in a playful and no-pressure way. Start by introducing the following five suggestions. And don’t be afraid to experiment and make up your own version of these exercises. Using the terminology “weather report” for children to reflect and express their feelings helps them to 1) not overly identify with their emotions (looking at the weather is simply an observation) and 2) realize that just like they can’t change the weather, they can’t change how they feel (emotions simply happen). If your child describes their inner weather as stormy or in other ways that indicate agitation and anxiety, help them to sit and watch the storm instead of reacting upon it. You may describe it as shaking up a snow globe and then watch the disturbance inside the globe settle down after a while. Help them to see and experience how their mind and emotions do the same if they simply sit and breathe. For a young child, it may be difficult to follow the instructions to breathe deeply and pay attention to their breathing. They may wonder, “What does that mean?” To make it more visual and practical for them, try using a “breathing buddy” exercise. Have them lay down on their back, put a stuffed animal on their belly, and instruct them to notice how their buddy rises and falls as they’re breathing in deeply, making their belly go up and down. “Meditation” is a bland word even for many adults. How can you make it fun and kid-friendly? One clever idea is to have your child activate their “spidey-senses” (or any other superhero senses that are outstanding and they relate to). With those abilities “activated,” ask your child to pay attention to anything they can hear, taste, or smell at the present moment. This exercise will help them to focus outward (away from the inner storm of anxiety) and not inward. An important way to counter anxiety is with exercise, such as walking outdoors. Most children really enjoy spending time outside, especially when the weather is nice (though, rain doesn’t necessarily deter them either!). Add some mindfulness practice to a walk by making it an adventure of discovery. Engage your child in calling out all the new things they notice on the path. Remember to include as many senses as possible, including silently listening to hear all the sounds around you. Again, this exercise helps your child to direct their attention to something else than their anxious feelings—until they subside. It isn’t hard to teach children age-appropriate mindfulness skills, but it does require parental involvement and time. Aside from having fun together, the best part is that you’re giving your child the ability to cope with their anxiety now and build a toolkit that can serve them well into their adult life.